An Englishman and an Irishman step onto the same train at Chicago's Union station and meet for the first time. Both singers, both songwriters...both broke, but intent on making their way by rail to Memphis, TN, the birthplace of Rock n Roll. That night, the two strangers began a conversation that lasted until the early hours. A conversation centered on their mutual love of the sounds of the 60s and 70s, of great albums and great artists, and great harmony singing: The Band, Simon & Garfunkel, Crosby, Stills, Nash and Young were all discussed. By morning they had named themselves Winter Mountain and committed to travel together, swapping stories, exchanging lyrics and singing together in the bars and clubs of the deep south. From their first performance it was impossible to ignore the rare magic of their natural vocal blend as heads turned whenever they sang. On their return the guys spent a fortnight songwriting in Ireland which led to a chance entry in a Battle of the Bands competition. Winter Mountain competed against the best unsigned talent in Northern Ireland, and won! It was enough to capture the heart of a local theatre owner who booked them to open for Irish singing luminary Cara Dillon. 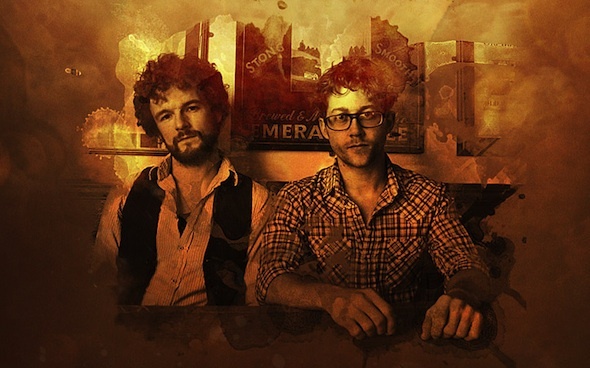 After hearing Joseph and Martin’s performance Cara and husband/producer Sam Lakeman immediately signed Winter Mountain to their independent label, Charcoal Records and set about assembling a team of experienced musicians who could help realise the vision that Joseph and Martin had for their music. With contributions from Robbie McIntosh (guitarist with McCartney, The Pretenders, John Mayer), Audrey Riley (string arranger for Coldplay, Nick Cave) and Leo Abrahams (guitarist for Brian Eno, Florence And The Machine), the songs were recorded in a host of vintage studios which echo the authenticity of their sound and the resulting EP, Find, Follow, blends exquisite melodies, heartfelt lyrics and above all else, compelling harmonies. The final, perhaps most striking touch to the EP was made when the highly acclaimed Mike Crossey (Ben Howard, Jake Bugg, The Arctic Monkeys), stepped up in the midst of his hectic schedule and mixed all three tracks. There have been the obvious comparisons to Simon & Garfunkel, The Fleet Foxes and The Everly Brothers and when you hear and see them perform you’ll understand why. Yet Winter Mountain bring something new to their vocal delivery, echoing those legendary harmony acts, but adding a vital, contemporary edge that is uniquely their own. Their vocals blend as if they’ve been harmonising for a lifetime. And although Martin’s from Donegal, Ireland and Joseph hails from West Cornwall, you get the impression they were born to sing together. Winter Mountain’s debut EP Find, Follow is now due for release on iTunes and other online outlets on 20th May 2013 on Charcoal Records.